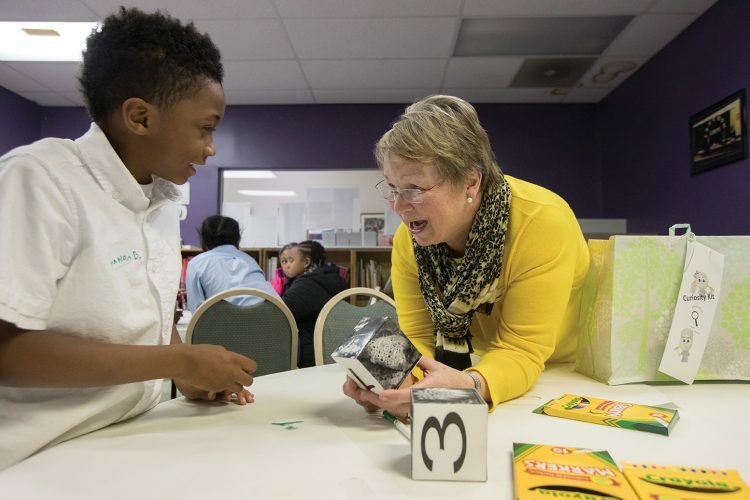 Cheryl Lindeman works with a Curiosity Club student at the Jubilee Family Development Center. On a recent afternoon, a group of fourth and fifth grade students from Dearington Elementary School for Innovation’s Curiosity Club worked diligently to piece together puzzles that formed mysterious designs. As the puzzles started to take shape, students began predicting what the images would turn out to be. “Mine looks like body organs!” one student exclaimed. “Eww, this one looks like the inside of somebody’s nose,” another said in disgust. One-by-one they called out their guesses, and after everyone was done, their teacher, Tawanda Copeland Johnson ’90, distributed sticky notes containing the correct answers and helped the students match them with the corresponding images. The students were shocked to find out they had actually been looking at highly magnified images of Band-Aids, Velcro, Oreo cookies, earwax, and even a stinkbug. The Curiosity Club is part of an ongoing study by Randolph education professor Cheryl Lindeman on inquiry instructional strategies. The project began over a decade ago when Lindeman worked with students at the Central Virginia Governor’s School for Science and Technology, which is located in Lynchburg, to capture scanning electron microscope images of common everyday living and nonliving things. During the most recent Summer Research program, she worked with a Randolph student to develop “Curiosity Kits” containing puzzles and paper blocks with the magnified images on them, as well as other items intended to stimulate intellectual curiosity. This year, Lindeman is conducting her research in the field, partnering with teachers in the Lynchburg area to introduce the kits in local classrooms. So far, she has helped start Curiosity Clubs at Dearington Elementary School for Innovation and the Jubilee Family Development Center and has also taken her Curiosity Kits to New Vistas School and the Randolph College Nursery School. 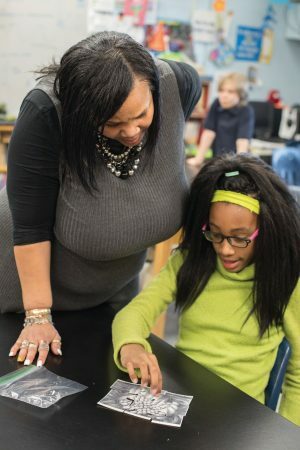 As the Science, Technology, Engineering, and Math (STEM) teacher at Dearington, Tawanda Johnson was intrigued by the concept when she saw a presentation last year by Lindeman at Randolph’s annual summer teaching institute, which is funded through a grant from the State Council of Higher Education for Virginia. Another activity in Johnson’s Curiosity Club includes encouraging students to use their writing skills. Johnson handed large bags containing the paper “curiosity” blocks with magnified images to students at each table. This time, however, students were asked not to identify what was shown in the image. Instead, they were to use adjectives and describe what they saw. “Hairy” and “stringy” were popular descriptors. Several Randolph students later used those descriptors to pair them with the corresponding images. A Dearington Elementary School student examines a block from a Curiosity Kit. The activities at each club meeting vary and are catered to the needs of the students. For instance, recently at the Jubilee Family Development Center, Lindeman encouraged students to be creative by asking them to identify the magnified images on the blocks— then draw and write a story about what they saw. One student, Marlon, discovered he was looking at bamboo, so he chose to write a story about a panda bear. Meanwhile another student, H’Niyah, wrote a terrifying tale about an invasive insect. Lindeman is looking forward to seeing the impact her lessons have on the students. 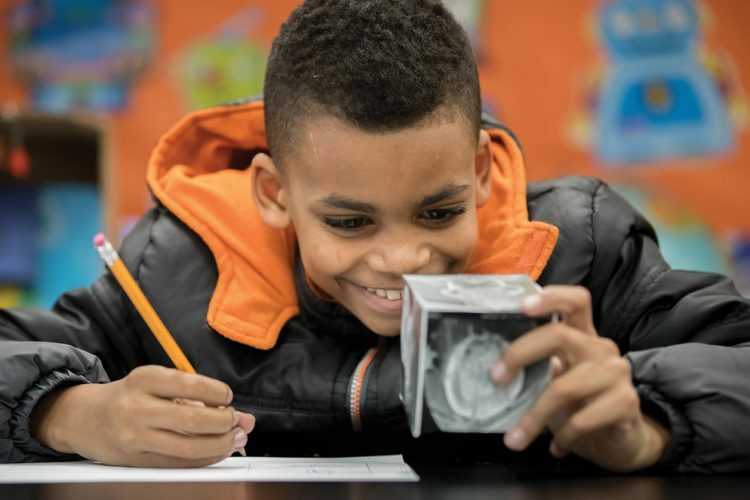 “For me, this has grown from being a project with students at the Governor’s School, where they brought things in and made sample mounts, to a program that is helping arouse the curiosity in children,” Lindeman said.